"They had battering rams and, you know, we had picked up different weapons they had stashed around the city," McAuliffe told Mckesson. "This was a powder keg. This was a very volatile situation. And I'll once again say, I am very proud of our team on the ground. Nobody hurt except for those people hit by the car and you couldn't stop that." "The governor was referring to the briefing provided him in advance of Saturday's rally and the extra security measures being taken by local and state police," Geller said. "As a safety precaution in advance of August 12, such searches were conducted in and around Emancipation and McIntire Parks. No weapons were located as a result of those searches." The contradiction represents the second time this week that Gov. 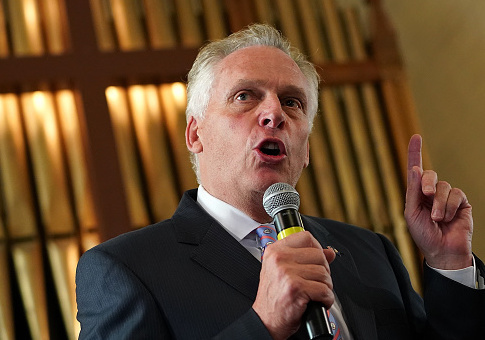 McAuliffe has been at odds with Virginia State Police. On Monday, Virginia State Police said they were not outgunned by any of the Charlottesville protesters and were well prepared to handle the event. "No, the State Police did not have inferior equipment," Geller told the Free Beacon on Monday. "Our personnel are equipped, and were equipped, with the necessary protective and tactical gear for their safety and, obviously, to protect those that were in attendance of the event." The State Police wouldn't release details on exactly what kind of equipment they deployed at the protests but said they were appropriate for the conditions. Despite the public comments from the State Police, McAuliffe repeated his claim that police weren't as well equipped as the protesters to Mckesson on Monday—adding that the Virginia National Guard was also outclassed. "If you see people yesterday walking down the street yesterday with semi-automatic rifles strapped to their body," he said. "I mean, they had better armor than my State Police and National Guard had." McAuliffe went on to say that, except for the maiming of dozens of protesters and the murder of Heather Heyer by a white supremacist sympathizer, he was proud of the lack of violence at the event. "I'm very proud, except for, put the car incident aside, no one went to the hospital," McAuliffe said. "Except for those 20 people, 19 people and the person who died from the car incident, not one single person went to the hospital. Not one shot was fired. And, believe it or not, not one ounce of property damage." The governor's office did not immediately respond to questions on why the governor and the State Police are at odds on what happened in Charlottesville. This entry was posted in Issues and tagged Charlottesville, Police, Protests, Terry McAuliffe. Bookmark the permalink.